Every time we choose a new president we decide our nation’s future, or at least that’s what we are told. It’s almost never true. Even the brashest, most out of control presidential act can be stopped dead in its tracks by a simple court decision. Money matters a lot more than who is in charge and in politics that means fighting over debt and spending, a battle with much higher stakes than bickering over who gets to be our national figurehead. The real war for America’s future is over the budget. The presidency is just a sideshow. 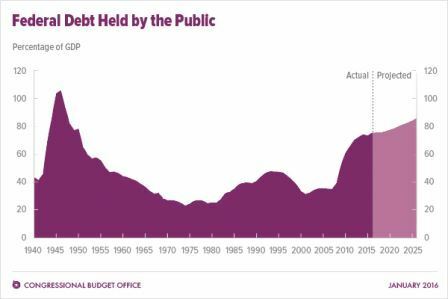 If we don’t do anything different than what we are doing right now, taxpayers will run a deficit this year $100 billion larger than in 2015.1 Fortunately, $100 billion is pocket change compared to the enormity of the national debt. It’s such a small number that we hardly feel it. That will change. Debt doesn’t just go away and as it grows the pain it causes grows with it. Treasury Direct’s “to the penny” calculations reported a total public debt of $19,226,417,790,338.55 at the start of the Memorial Day weekend. A year ago it was $18,152,317,304,208.14 according to the site’s nifty government debt calculator. Economists like to discuss the pros and cons of debt and the deficit. This is a phenomenally deep hole any way you spin it. You have to wield incredible power to control the spending that keeps growing the debt number. More important, you have to balance the blame game with the fact that much of federal spending considered mandatory goes to entitlements Congress is terrified to touch. Congressional inertia on spending doesn’t mean Capitol Hill can’t have some fun with its budget charade. If nothing else, party leaders can use debt and spending to press hot buttons that catch our attention and make it seem as if something momentous is happening. What that means is different for each side. This is how debt and spending cuts work for the GOP. The headline from House Speaker Ryan insists “The Obama Administration BROKE THE LAW.”2 This doesn’t limit the possibilities very much, but it turns out that Republicans are boasting their latest victory in House vs. Burwell, the Obamacare cost-sharing lawsuit. Paul Ryan calls it a “historic win for the Constitution” that stopped the White House from “spending taxpayer money without approval from the people’s representatives,”3 Did he forget that these are the same representatives who incurred so much debt in our name? Our speaker didn’t mention just how much we are saving by clipping the administration’s wings, but the numbers are easy to find. House Republicans have to embrace principle. Real debt and spending victories are few, far between, and often trumped up. Appeals to values, the law, and the Constitution are often their only sops to appease the conservative public. That means little or no progress with public debt or the mandatory spending that helps maintain it. The nation’s penultimate example of Democratic responsible governance is Illinois, a state destroyed by spending on behalf of the Middle Class, government workers, immigrants, and every other excuse public officials can come up with to spend money that doesn’t exist. Puerto Rico is another example, a $72 billion disaster being excused by appeals to the common man. Exercising those rights didn’t stop Puerto Rico from ruining itself, but that’s how this kind of rhetoric works. People with jobs and money pay to service debt while their representatives get fat and happy racking up more on their behalf. If you doubt this is true, come and live in my state. There isn’t a dime spent in Illinois that isn’t for the sake of long-suffering, hardworking families and penniless teachers. There is real power in being able to control part of Capitol Hill’s elaborate debt and spending scam. Paul Ryan is absolutely right. The power of the purse is Congress’s prerogative. Lawmakers can choke off funding or make the dollars flow with abandon. The wisdom is in not using that power for political gain, to punish, or to ruin taxpayers. We would like to hope it also lies in scaling back the cataclysmic debt entitlements and other necessary spending items will generate in the coming years, but that’s probably giving our lawmakers and their kick the can budget mentality far too much credit.